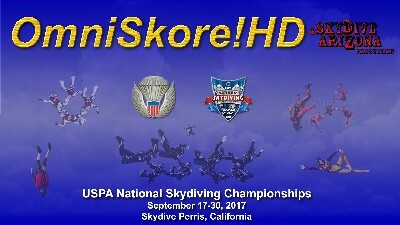 Welcome to the OmniSkore!HD coverage of the 2017 USPA National Skydiving Championships of Artist Events, Formation Skydiving, Speed Skydiving and Wingsuit Flying! Use the links at the left to enjoy up-to-date results of the 2017 USPA National Skydiving Championships of Artist Events, Formation Skydiving, Speed Skydiving and Wingsuit Flying, including scores, competition draw, videos, and standings. Until the last one or two rounds of 4-Way, videos are .mp4 format, which do not play in Chrome / Android. During round 9 of 4-Way the format was changed to WebM, which is designed to be more Internet-friendly. Windoze users should use Chrome, which has the best support for the WebM format. See the "Wednesday, 27 September" OmniBits, under 0700, for additional details, and workarounds for Apple / iOS / iPhone users.